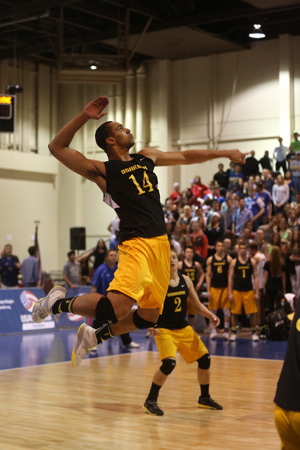 The UW-Oshkosh II menâ€™s volleyball team reached the semifinal round of the National Collegiate Volleyball Federation Division III tournament held Thursday through Saturday (April 12-14) in St. Louis, Missouri. The Titans went 7-1 to finish third out of 48 teams in the three-day event. UW-Oshkosh II (42-9), ranked #7 to start the tournament dominated Rutgers University â€“ New Brunswick II, 25-14, 25-12, dismantling Michigan State University II, 25-13, 25-19 and beat #22 Utah Valley University II, 25-18, 25-22 to finish 3-0 in their opening pool. In the three matches UW-Oshkosh II was led by Stephen Seaman (So. â€“ Muskego) with 25 kills while adding 23 digs and seven service aces. Ryan Albers (Sr. â€“ Appleton) dished out 71 assists and collected 18 digs, four service aces and seven blocks and Quinn Arndt (So. â€“ Muskego) led the team with 43 digs and provided four service aces. Matt Aussem (Fr. â€“ Glendate) totaled 23 kills, Reed Bogrand (So. â€“ Mukwonago) added 17 kills and a team leading nine blocks and Steve Cotton (Sr. â€“ Muskego) had 13 kills and seven blocks. Joey Mack (Jr. â€“ Muskego) had 13 kills and six blocks and Eli Miller (Jr. â€“ Burlington) scooped up 18 digs and had five service aces. On Friday, UW-Oshkosh II swept the University of Missouri II, 25-15, 25-21 and prevailed over rival #10 Penn State University II, 25-14, 25-16 in dominating fashion to advance to the Gold Bracket on Saturday. Against the Tigers the left side hitting duo of Aussem and Seaman shined in collecting 11 kills each; while Seaman added eight digs and three service aces. Miller provided seven digs and two service aces and Albers had 28 assists and two blocks. Bogrand had three blocks and four kills and Arndt had 13 digs. The Titans offense roared in the win over the Nittany Lions as the Titans had 31 kills in the match to go along with 38 digs and 11 blocks. Aussem led UW-Oshkosh II with 14 kills on a .545 hitting percentage. Seaman provided 11 kills and eight digs and Arndt tallied 21 digs. Albers had 28 of the Titans 29 assists and added four blocks and Bogrand provided six kills and five blocks. Mack tallied four kills and two blocks, Cotton had six kills and Miller had nine digs and two service aces. The Titans passed extremely well that led to a .468 team hitting percentage. In the single elimination gold bracket on Saturday UW-Oshkosh II survived an opening round scare against #21 James Madison University II, 25-15, 23-25, 18-16 and then beat #2 Indiana University II for the third time this season, 22-25, 25-23, 15-12 to advance to the semifinals. Aussem had 15 kills against the Dukes to lead the Titans. Arndt had 23 digs and Albers dished out 37 assists. Bogrand provided five blocks and Miller had three service aces. Seaman came up big against the Hoosiers with 17 kills and 12 digs. Albers ran the offense with 35 assists and added three blocks and eight digs and Cotton had seven kills and three blocks. Arndt had 18 digs, followed by Miller with 11 saves. Mack pitched in five kills and four blocks and Bogrand had three solo stuffs. In the semifinals against #6 Ohio State University II, UW-Oshkosh II ran out of gas in a 25-20, 25-22 defeat. Bogrand led the team with five kills and added three blocks. Arndt topped the team with 13 digs and Seaman had nine kills and seven digs. UW-Oshkosh II was well represented on the NCVF Division III All-American team with Arndt leading the way being named to the First-Team. Albers was selected to the second team and Bogrand and Seaman were each named to the honorable mention squad. Arndt previously was an honorable mention selection as a freshman in 2017 when he was a member of the UW-Oshkosh III team.